I made it to Chicago despite an extremely turbulent flight, opting to take an earlier route to Midway instead of O’Hare. The taxi queue was epic and made me long for the organization of Las Vegas. I did run into several friends in line, although none we headed to the same hotel. Although I’m usually annoyed when my taxi driver talks on the phone while driving, this one was lecturing his high school daughter on her GPA and the importance of getting into a good college, so I just relaxed and enjoyed the ride. Besides catching up on new products and doing research, the main reason I come to HIMSS is to catch up with colleagues. It’s nice to be able to chat in person and the event brings so many people together. A friend who has missed the last couple of HIMSS conferences met me and we enjoyed the long walk to the convention center for registration. Other than a few sprinkles, the weather was gorgeous. The only thing that could have been better would be if Google Maps had not been providing walking directions that felt like we had been bar-hopping first. While waiting outside the opening reception, I ran into a CMO friend that I hadn’t seen in several years and we talked about her new work with the VA system. Our employed specialty physicians provide a lot of care to veterans outside the VA clinics, so we talked about some strategies for making sure all the information is shared not only within the VA but with the community physicians who deliver increasing amounts of care for veterans. The reception opened a bit early and there were plenty of bars and buffets set up. The band was named The Fat Babies and was playing to the backdrop of scenes from The Untouchables on the video screens above and behind them. I haven’t seen it in years and the younger Kevin Costner and Sean Connery reminded me that I’m not getting any younger either. I’ve officially been in healthcare IT for more than a decade. Had you asked me at the start whether I’d be doing it full time, I’d have thought you were crazy. The reception brought some interesting characters my way. Since I was there early enough to grab a table, I made a good target for solo attendees looking for a place to set their drinks while they ate. People aren’t afraid to just introduce themselves and start talking, and my wing-man got to see me almost choke when one of the random people started talking to us about absolutely ridiculous things. Despite the titles on his badge, he had only a loose grasp of some of the key concepts in health IT, so we educated him on the Direct protocol and how physicians need to incorporate received data into patient charts – not just leave it in some email box. I had to leave my wing-man after the reception, but he promises to share many stories about other characters on our upcoming stroll through the exhibit hall. After the reception, we headed towards the river with a stop at Rebar at Trump Tower. It has a beautiful view and apparently also was hosting a get together for Healthfinch, so we enjoyed seeing celebrities come and go. After a quick dinner we headed to the Divurgent/Experis reception at Roof on the Wit. I was traveling with a pack of party animals who decided to have a contest to see how many people each knew. The competition was stiff and I was quickly reminded that even though I’ve been around a while, I’m but a young pup when it comes to networking. 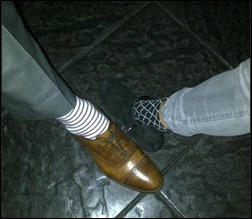 I did run into Nordic’s Drew Madden who showed off what must be the year’s hot accessory – snazzy socks. He informed me that he brought a special pair of shoes for HIStalkapalooza. On the way to catching my beauty rest, I happened upon the Aventura team at the Palmer House bar. 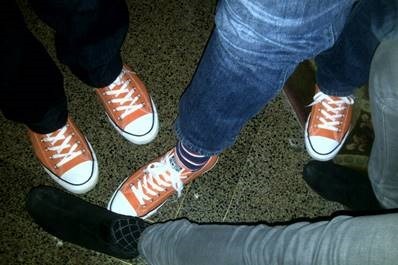 I didn’t make it to the HIStalk sponsor reception (it’s a little tricky to do that and remain anonymous) but they promised a pair was waiting at their booth. I’m excited and think I’ll sport them at Quipstar rather than the sparkly numbers I brought.